The Preston Single Channel Mounting Plate mounts to the back of a Preston single channel focus/iris unit. This bracket provides a 3/8″ threaded hole. 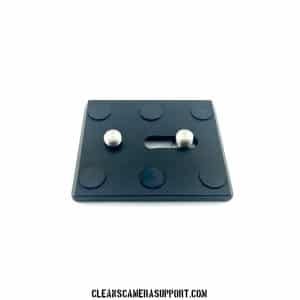 This Mounting Plate comes with longer screws to replace the screws on the single channel. also included is a 3/8″ to 1/4″ reducer insert. The Mounting Plate in no way interferes with changing the battery. Preston monitor bracket & micro quick release sold separately. As of May 2018, all preston single channel plates sold will have the cutout for the external antenna switch. “available on backorder” items will be available in 1-3 weeks. See “FAQ” for more details.